Is Kibibi 21 in Human Years Yet? The phrase "not just another happy hour" doesn't even BEGIN to cover this one. Alcohol and baby animal hugs. They're both great on their own, but together, we can't even handle it. Let's take stock, shall we? 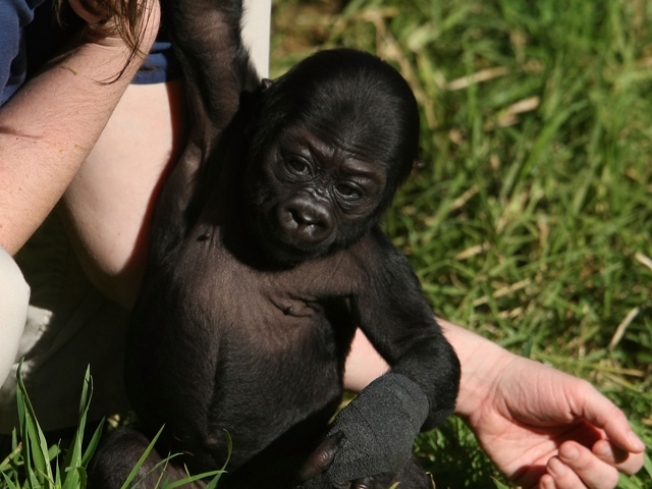 Tastings from local wineries, snackies from local restos such as Urbana, a high-falutin' discusson on the nutrition in red wine, and... OK, who are we kidding, you get to see the widdle biddle baby gorilla, Kibibi! EEEE animal bebehs! Um, anyway, where were we? Oh right. Tonight at 6, Grapes With the Apes gets going at the National Zoo (3001 Connecticut Ave. N.W.). Tickets ($30-$40) include copious wine samples, a commemorative glass, live music and a discussion called "Taste the Tannin: Wine and Zoo Nutrition," which we really hope isn't about how they liquor up the animals after hours, because that would be very wrong. You'll also get the, uh, opportunity to visit the Great Ape House after hours. After hours or not, that place is stinky, so make sure your senses are well-insulated by wine before you set a Bandolino inside that thing. On the educational side, world-renowned scientists will discuss their work with great apes. Take note: If you shell out for the VIP tickets, you'll be privy to private samples and an exclusive pre-party.